Disalienation in the traditional city, then, involves the practical reconquest of a sense of place and the construction or reconstruction of an articulated ensemble which can be retained in memory and which the individual subject can map and remap along the moments of mobile, alternative trajectories. The area we visit is full of hamlets and villages and is definitely not a city but perhaps any complex arrangement of spaces can be considered or read as such in the terms that Jameson uses. 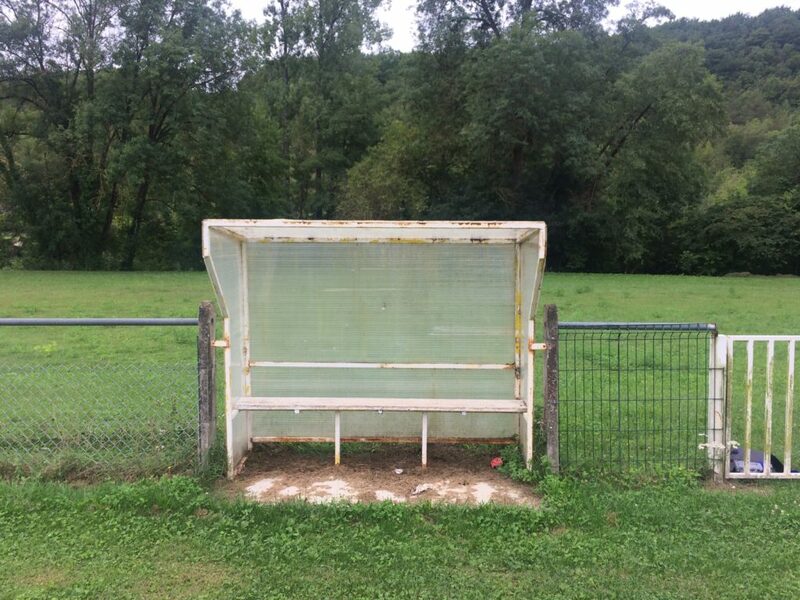 During our visit this year I took a walk through Condat-sur-Vezere, headed to the stadium, and noticed that there was a match scheduled for the last Sunday of our stay – Condat-sur-Vezere FC v Limeuil FC in the first round of the Coupe Nouvelle-Aquitaine. In the weeks leading up to the match I visited the ground to record the sound of football not happening. The Coly a tributary of the Vezere River runs to the south of the stadium; the D62 to the north. shifting cloud of white noise from the River Coly; wind through the screen of trees on the far bank; a voice; there seems to be a distant melody; flies buzz past; occasional waves of traffic on the D62 their sound rolling down the embankment spilling across the pitch and reflecting from the dugouts; the distant feral drone of an industrial process – perhaps the factory across the Vezere in Le Lardin; small birds in the low trees and bushes; slow moving waves of harmony as tyres sound asphalt moving from left to right – right to left; laughing; a blackbird sounds the alarm; a dog barks; a wood pigeon calls close by and then again in the distance; the drone of the factory is submerged by a breaking wave of birdsong and local traffic; someone cuts their way through the undergrowth; the white noise of the river is constant the slow flow sounding the rocks and banks; a large rattling truck with flat tyres grinds towards Saint Genies; clanking; chains; a shout; air vibrates with the distant rumble of jet engines; a magpie calls; the feral drone of the factory heads up the valley. 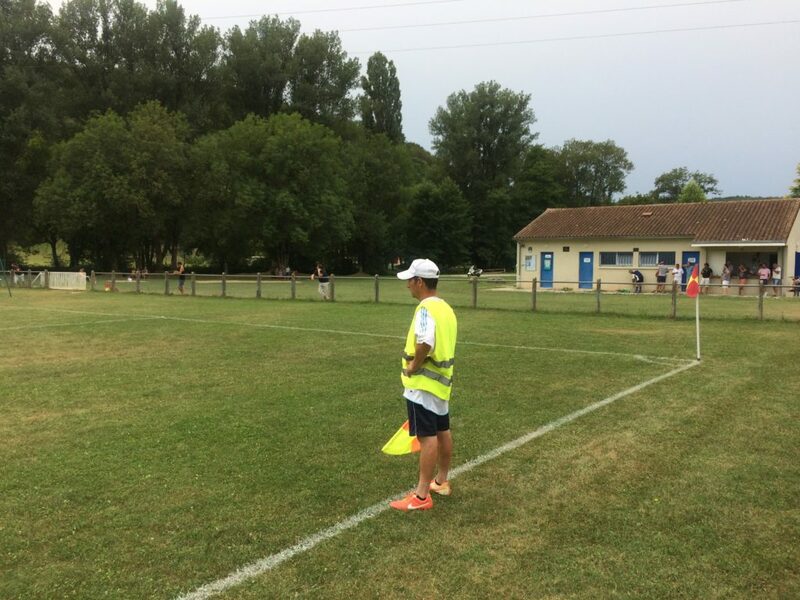 We arrived at the match during the second half and stood near the club-house and behind the assistant referee. There was a small bar and the constant sound of conversation; spectators on their phones; children playing; and sporadic applause. There were around seventy to eighty spectators at the game leaning up against the barrier that surrounds the pitch and gathered underneath the scoreboard. 3:48 je sais qu’y a Maurice… Maurice? : I know there’s Maurice… Maurice? So to conclude it looks like someone called Janine (or perhaps Nadege) ordered some mixed dishcloths and tablecloths but the order was lost and Geraldine will look into it but if she can’t sort it out then Maurice will get involved. Maybe. And someone scored from a free kick around 7:05 possibly because Benoit didn’t get in the wall. When I asked Gerald to listen to the recording I wasn’t specific about whether I just wanted the on-pitch communication or whether all of the conversation was of equal value. I have often recorded and transcribed pitch-side conversation relating to the game – for example discussion with the linesman here – but have rarely concentrated on the everyday conversation evident in Gerald’s transcription; the discussion of dishcloths, tablecloths and relationships; the conversations of bar staff; and spectators catching up with each other is an essential element of the sounding experience of the match.